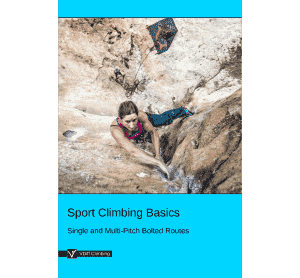 Carabiners (often shortened to 'crab' or 'biner') are the mainstay of the climbing system. 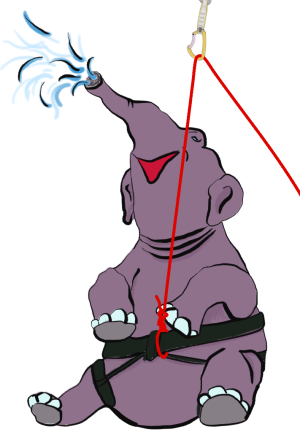 They're used to attach the rope to pieces of equipment, or to join two or more pieces of equipment together. Generally made of aluminium, heavier steel ones also exist. Shapes vary, but it's always some kind of elongated triangle or oval, with an opening gate on one side to allow you to easily clip and unclip stuff. There are two main types: screwgates and snapgates. Snapgates are the simplest carabiners. The gate is hinged and shuts with a spring system, but isn't locked in place in any way. 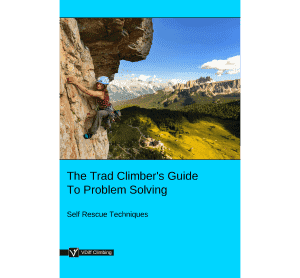 They're used for clipping the rope to gear, but not for anything really important such as belaying or anchors. The gate can be made out of solid metal or a loop of wire: both work in the same way. Screwgate carabiners are used when you need to be 100% sure that the gate won't pop open. They're slower to use than snapgates, but safer. 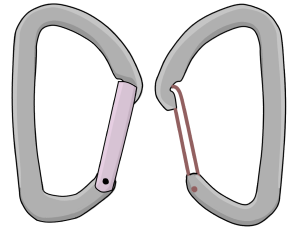 The gate has a screw system on it, so a rotating tube on a screw thread goes over the 'nose' of the carabiner, locking the gate in place. To unlock it, simply unfasten the screw. Don't be tempted to tighten the screw too much when closing it; you'll never get it undone again! 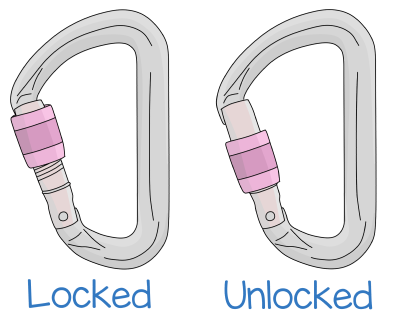 You may also come across autolocking carabiners. The locking tube on these isn't threaded, but instead springs into place and needs twisting in a certain way or a button pressing to unlock. They're just as safe as screwgates, though can be fiddlier to use. Autolocking carabiners that use a magnetic catch are now also available. 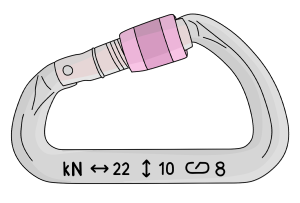 Climbing carabiners are always rated to at least 20kN (kiloNewtons). You don't need to understand the numbers, but that's REALLY strong. Strong enough to hold an elephant. They are weaker if you 'cross load' them (load them sideways) or load them with the gate open (another reason to use screwgates for important stuff). The kN rating will always be written on the side of the carabiner; this is how you know your carabiner is safe for climbing and not just for your key chain. 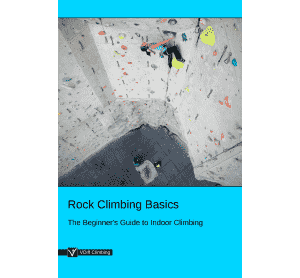 How Many Carabiners Do I Need To Start Climbing? Here's the good news: probably just one! 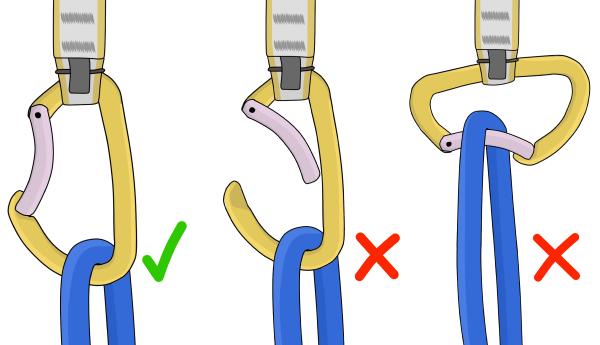 When you're starting out at the climbing wall, you'll just need one screwgate carabiner for your belay device (see later). 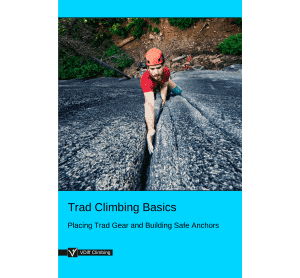 If you want to climb outside, you can build up a 'climbing rack' over time that will include a lot of carabiners. There's no rush though; learn the basics first.